Apples are everywhere this time of year, in fact it’s the perfect time to go apple picking if you’re into that sort of thing. We love it, and my daugther who is 23 has been asking me all week if I’d like to go. So it looks like we’ll be setting a date to head over to Eckerts soon. This month the 5 Star Makeover challenge was to make something using apples – the perfect fall fruit, IMO! For years I’ve been making Peaches and Cream Cheesecake. If you can believe it, this is a recipe I got from a friend in college – more years ago than I care to share. It was so good I made it for my family, and to this day it’s the only dessert they request I bring for family functions. This month since I had the 5 Star Challenge I decided to make it with apples. Rather than using the semi-homemade ingredients typically used, I made it totally from scratch. Still delicious, but takes a bit more time to prep. I think you’ll love this dessert. If you’re in a hurry and time is of the essence, then I’ve provided you with the semi-homemade version which is still to die for. In fact, whenever I serve this at a function, of all the desserts, everyone asks me for this recipe – that’s how good it is. I hope you’ll try it. Here’s the recipe…. 1. Cake Base: Combine ingredients and beat at medium speed until blended, about 2 minutes. Pour batter into 9" springform pan that has been coated with non-stick cooking spray. Be sure to place foil under pan as some of the liquid could ooze out. 2. Pie Filling: Melt butter in heavy pot; add apples and all remaining ingredients, except flour. Partially cook fruit over low heat for 15 minutes, stirring occasionally. Stir in the flour and set aside while preparing cream cheese mixture. 3. 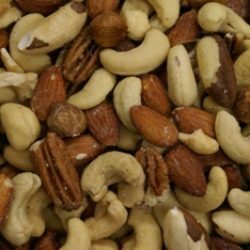 Cheese Filling: Combine ingredients and mix on medium speed until well blended, approx. 2 minutes. 4. Layering: Take apple pie filling and spread evenly over batter. Spread cream cheese layer over apples, covering entire surface. An offset spatula works perfect for this. 5. Topping: Sprinkle cinnamon/sugar over cheesecake filling. 6. Pudding: (if not using box mix) Combine ingredients and store in an airtight container. Make 3 cups. 7. Bake in 350 degree oven for approximately 30-35 minutes or until bubbling around edges. Can be served warm or cold. that looks sensational! 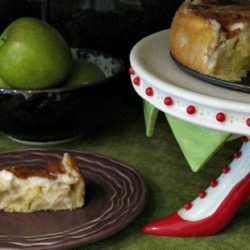 I’ve never had apple cream cheesecake – but can’t wait to try! I served this recently and everyone loved it. I hope you do as well. It’s delicious! You can tweak it anyway you like using other fruits. I’m sure it would be just as good. The other way I’ve made this is with peaches – YUM! Apples with any kind of creamy delicious cheesecake is the way to bring on the apples. Well IMO it certainly does wonders for these apples. what a delicious way to compliment apples awesome job! Thanks Claudia, I hope you try it. It’s definitely a winner. I hope you try it. Crisp, juicy apples are one of my favorite things about this time of the year! This cheesecake looks fantastic! A great fall dinner party dessert! It’s great for a gathering but be prepared you won’t have any leftovers so you may want to double the recipe. That’s a different take on cheesecake. I bet it tasted good. 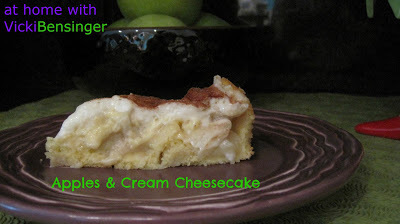 This is such a beautiful cheesecake, and such a fun twist on apple cake. I would love to give this one a try! 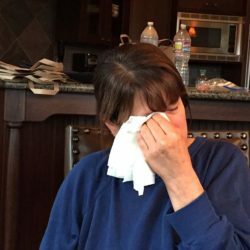 I’ve never seen a cheesecake recipe with dry vanilla pudding mix or pudding mix of any kind. what a clever idea! I bet it makes it lighter than most cheesecakes which, the heaviness of a cheesecake is one of the reasons I don’t eat it much. I love this apples and cream and would love to see your peaches and cream! The peaches and cream cheesecake has been a staple in my home since I was in college and now in my own family. I have to tell you I’ve only made it with the pudding box (jello – not instant). I’ve served it for home functions and brought it to various events all with rave reviews. It’s the same recipe only using canned sliced peaches – a 15oz can or if doubling the recipe a 30oz can. Using the syrup from the can for the cream cheese filling. I posted the alternative using canned apples. The same would apply using canned peaches and pudding mix. I hope that helps. Never really knew what was in dry pudding. Very interesting. Neat contribution to the makeover! Your cake pedestal is a hoot! Thanks Lori Lynn. For years I’ve made this recipe with peaches and vanilla pudding mix (not instant). When we were given the challenge I thought noes my chance to try it from scratch without any semi-homemade ingredients. It turned out wonderful. That said, I’m sure I will make this recipe a million times again but will probably use the jello pudding mix strictly for ease of preparation unless I have the homemade mix on hand. This recipe is so delicious and either way it’s a winner. One more thing – I’d still make the homemade apple pie filling but the canned is great as well. Just my preference. Then I can lick the leftovers in the pan! By the way the pedestal is from Patience Brewster. I’ve been in love with it for years. It’s so whimsical. Glad you like it. I think you’ll love the addition of apples. Love the idea of an apple cheesecake! I’ve had cheesecake in loads of flavors, but never apple. Interesting idea to use a dry pudding mix – and like some of the others, I had no idea what was in it! Very cool to have that recipe. Good stuff – thanks. Thanks for your comment. I think you’ll enjoy it if you decide to make it. My ears always pick up when someone tells me the recipe has a pedigree and has been made for years… I have almost never been disappointed. This is a great looking dish… creamy apples sound amazing.! I promise you won’t be disappointed. If you don’t feel like going to the trouble of making everything from scratch use my semi-homemade version. I’ve been making it this way for years. 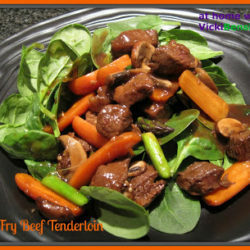 What a wonderful way to switch up a recipe for fall! I love the idea of the homemade apple filling as well. Is the peaches and cream version exactly the same except for the fruit? That also sounds delicious. Yes the peaches is exactly the same. Although I’ve only made the peaches using the canned sliced peaches and the syrup for the cream cheese filling. My family insists I make it exactly the same way all the time because they love it so much. I guarantee this will be a HUGE hit to whomever you serve it to. I think you’ll find you love this recipe. Everyone is making apple dessert or baked goods and I’ve been enjoying observing. One day I need to start using apples in baking, especially my kids get bored by winter that they don’t want to eat simple apple as fruits… LOL. What a fantastic cheesecake Vicki! p.s. sorry my response has been delayed… I promise to write you back! Wow Vicki, this looks amazing! I love the idea of an apples and cream cheesecake – I’ll have to try it! 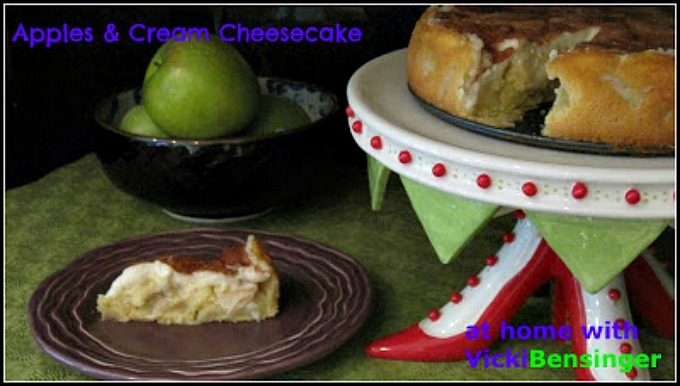 I’m a cheesecake fiend, Vicki and an apple and cream cheesecake sounds divine. I absolutely love the idea and can’t wait to give it a try. Not a big sweets eater but would love to try this. Good job. Vicki, this dessert looks divine. It does sound like it takes a bit of time to put together though. 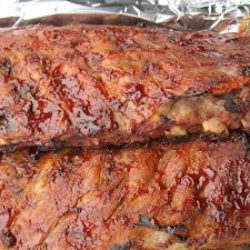 Vicki, you’re making me crave this! Love the mix of cheesecake and apple pie for this time of year. Perfect! That is my hobby to cook and to bake all the new dishes that I meet here and that is so good to do that.